Sedum - stonecrop, ice plants - are hardy clump forming perennials. 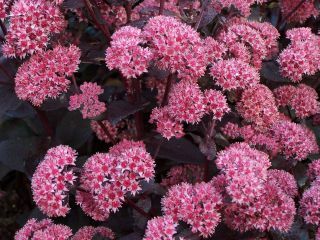 They have hard leathery, wonderfully coloured foliage that can vary from greens, reds and purples. Also have fantastic broccoli like flowers, they are tight in bud and open to bright colours in late summer through to autumn. They always look extra good when the frosts come as they get that extra bit of sparkle. Rabbits do eat a little of the sedums but don't worry its not their favourite! On a bonus they do attract bees, hover flies and friendly insects. After a couple of years the sedums respond well to being divided in autumn or spring. They are very easy to grow and like normal to alkaline soil - but don't worry you don't need to get the test kits outs they will be ok if you have a little acidity too. Again like most plants they love the a little sun when they can get it. Come winter we do suggest you trim them back but just leave a little bit of the stems with the foliage that way you know where they are and they regenerate from the base.